Thomas Quality Construction is the company to turn to for fire damage repair in Central Kentucky. Our talented, experienced fire damage team will work quickly to restore your home or business to pre-loss condition. Thomas Quality Construction specializes in restoring dwellings and businesses that have recently been damaged by various sorts of fires. We have dealt with the worst situations and we have the ability to restore your property back to its original condition. Our fire damage team will walk you through the procedure every step of the way. Before we get started, we must assess whether the building is structurally sound and if it’s safe for our team to be working in the structure. It’s hard to imagine anything more life-changing than a fire in your home or business. Even a small fire can cause extensive damage. Fire not only destroys what it touches, it creates soot that adheres to walls, ceilings, floors and contents. In addition, smoke leaves behind difficult-to-remove stains and odors. 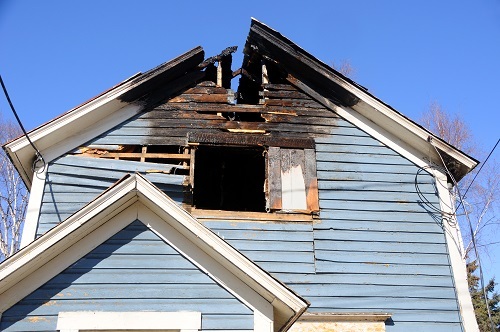 When it comes to fire damage repair, rebuilding your home is a very specialized procedure. Building materials, design and finishes all have to be matched to the remaining structure. Smoke odor must be neutralized. Upon arrival, our team will secure your home or business and then focus on preventing further damage and deterioration to safeguard precious items. Restoration methods today can save many building components and valuable personal items. The building professionals at Thomas Quality Construction can help you bring your home back to life. We start immediately by assessing the damage, clearing the site, tarping roofs and boarding windows and doors when necessary. We then work to remove the fire damage to your home including damaged structural elements and smoke-damaged surfaces. Fire damage usually means water damage as well, including the destruction of floors, walls, windows and foundations. A house fire, no matter how big or small, can cause a lot of stress. Thomas Quality Construction specializes in fire damage repair. Cleaning up and restoring the contamination created by soot, fire and smoke requires expertise. Harmful contamination is just one among many hazards that can arise from a fire. Smoke permeates far beyond the burned area, into air vents and the attic, leaving behind an unpleasant smell that can linger for a long time. For these reasons and more, you’ll want to use Thomas Quality Construction as soon as possible. When it comes to dealing with fire damage to your home or business, there’s no such thing as a “small” fire. The aftermath of any fire is a big deal. The fire may be out but the remaining problems caused by smoke, soot, odor and water damage are not. Often, the smoke, heat and soot damage along with the water used to extinguish the fire causes the most damage. Start putting your life back together after a devastating blaze by turning to the specialists for fire damage repair and restoration at Thomas Quality Construction. Once the last embers have been extinguished, it is time to start moving forward with the process of rebuilding your home or business to the condition you once enjoyed.